I am not quite finished with this little painting – 7×10″, but I am happier how it turned out from when I started. This is another lesson from the book I purchased. I will be going back to it when it is dry and try to straighten out my chimney pots and telephone pole. 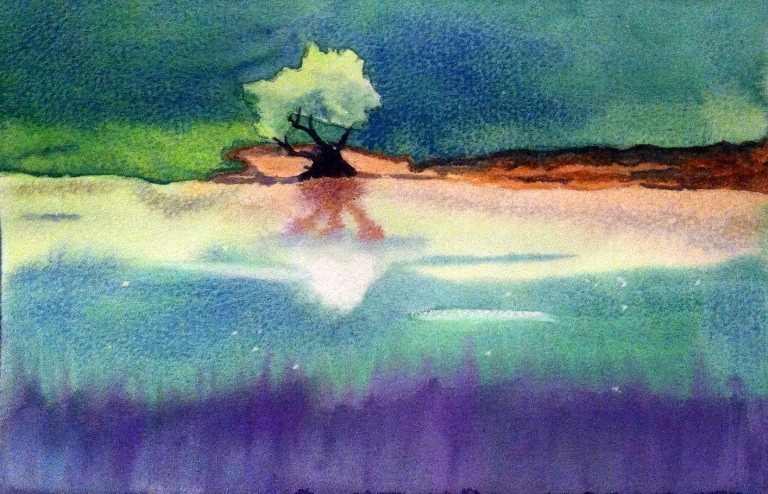 I used all of the colors suggested, except I used Alizarin Crimson instead of Permanent Rose. Mixing the colors for the silhouette directly on the paper created interesting textures, though the color is not as dark as in the book. 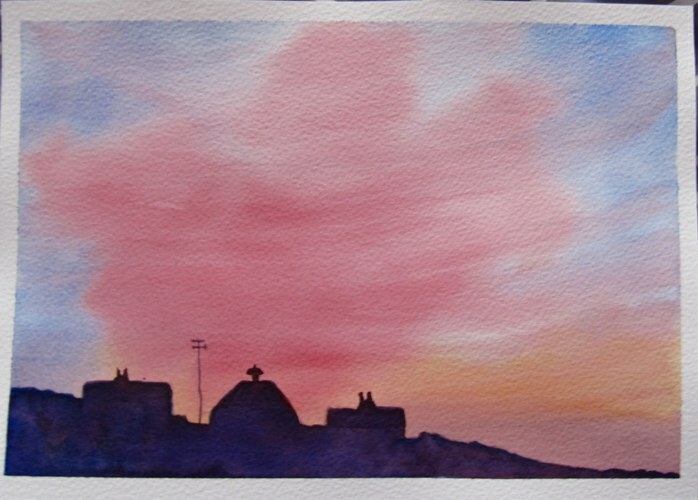 I used a mixture of Ultramarine Blue and Cadmium Red, but it wasn’t dark enough, so I added Windsor Violet. I think that if I really want a blackish mix, I would add Burnt Umber to the mix next time, but I am really happy with this for now. Here is the lesson. Sorry about the quality of the photo, but you get the idea. When I did the first wash, I went in a bit linear with my brush strokes rather than with a sweeping movement going upwards. The second wash was a bit better. There was a lot of waiting for paint to dry in-between washes, so I started a sunflower painting from some videos I found on youtube. I found a Canadian lady who is very informative and has some great demos. Her name is Angela Fehr. Check her out. I found her while trying to find out how to load your brush with water and paint. You would think my tutor would have explained this by now, but he hasn’t and there is only one more class left to do. Hey ho! In any event, I am learning from my books and from the wonderful people out there who post videos on youtube. Thank goodness for the internet! Here is the second lesson I have done from the book I purchased. The photo was taken with my i-phone and is marginally brighter than the actual painting. What I have learned from doing this painting: I need to work on my highlights. It was difficult removing the paint to make them when the paint was still wet. The other thing is not to be afraid of using bold color when called for. 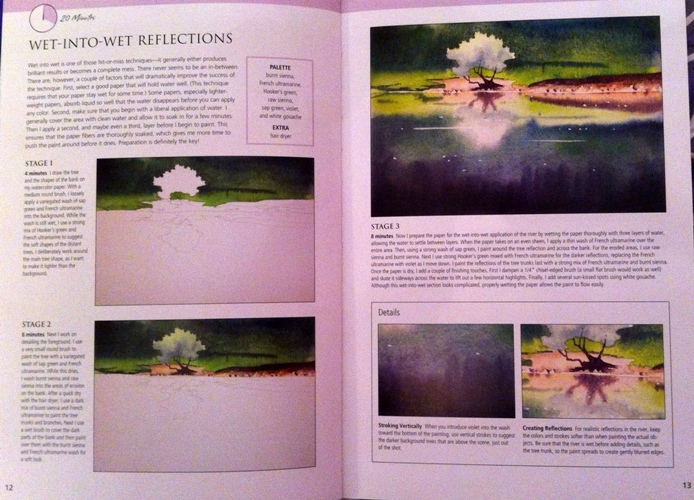 The top part was worked wet into wet on dry paper and the bottom part on wet paper. I will most likely try this on one of my own landscapes. We have used these techniques in class. Here is the lesson. This lesson is supposed to take 20 minutes, but it took me about 45! 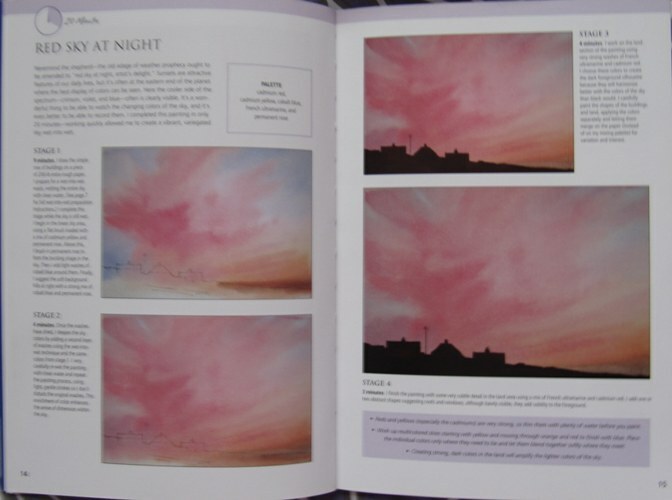 If I have any criticism about this book, it is that I feel there should be a photograph of the drawing. However, each lesson is on two pages on an A5 page and there wouldn’t be enough room. In any event, I am looking forward to trying the next lesson! 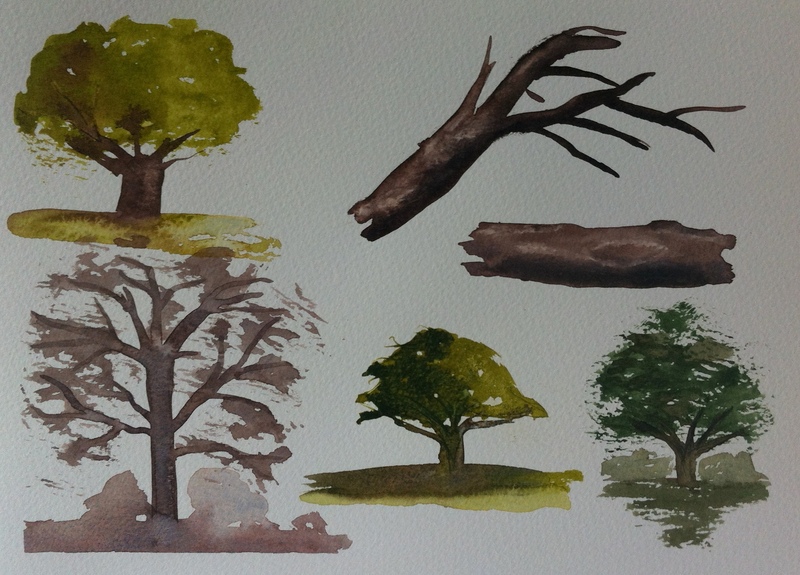 We kind of went back to the beginning and painted trees. I really need to work on my trunks. However, to be fair, we didn’t have any reference photos to look at and just either tried to copy the teacher or paint what we thought of how tree trunks should look. This is actually quite a small piece of paper. I was running out of large sheets so I cut them in half to about 7×10″. I have also been using the backs of work from class in order not to waste paper. I haven’t created a masterpiece yet, so I am happy to use up what I have for now. As you can see, my tree trunks need some work. We used wet in wet and a dry brush technique. My tree in the lower right corner is my favorite. 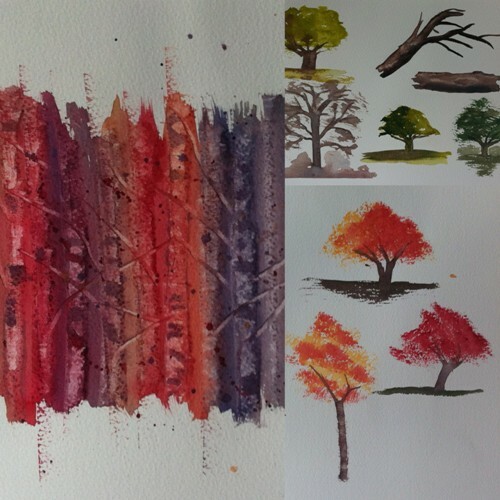 We also learned how to create bark effects by lifting off paint with the brush. I am really happy with my log. I was the only one in class to make one. 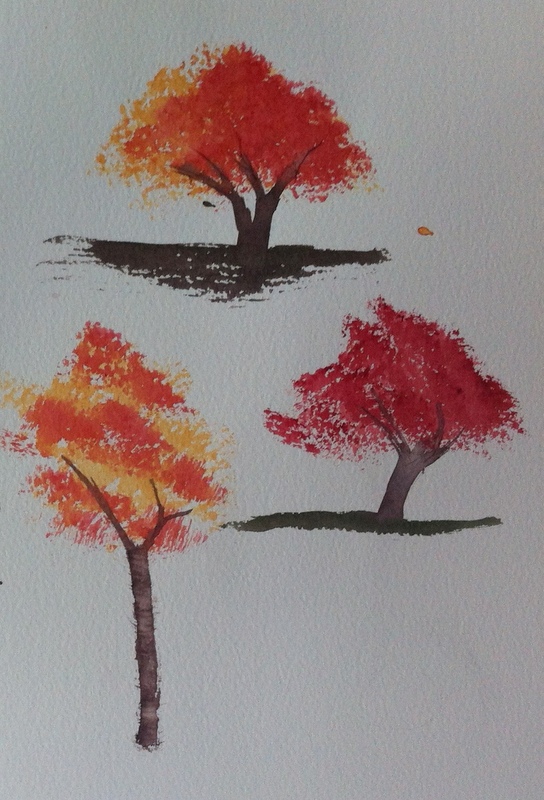 These trees were made with sponges and are meant to be Autumn colors. It’s a knack, one that I will hopefully acquire in time. 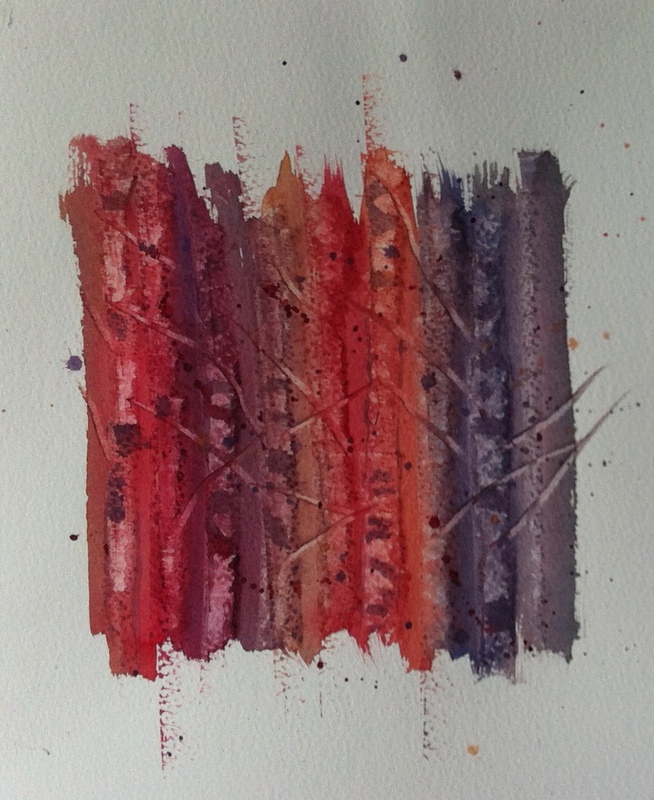 Here we created an abstract birch forest by scraping away paint with a credit card. You have to be quick and do this before the paint dries. My scrapings were not too great, so I added contrast with some grey I had made earlier. I have seen a similar technique with acrylics. This was the most fun thing we did in class. I wasn’t going to show my still life paintings from the previous class, but since I have already left myself open to ridicule I might as well continue. I happened to draw and paint the hardest thing in the class. 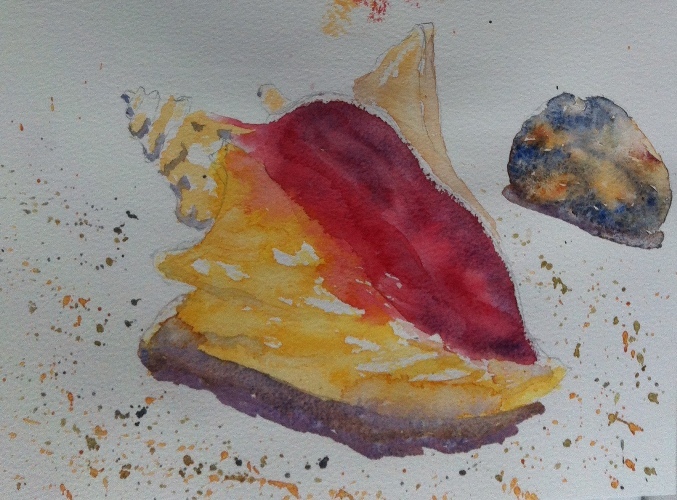 The conch shell’s colors were considerably muted in real life, but I wasn’t really trying to capture an exact replica. I failed considerably with the inside of the shell and learned after the fact how I should have done it. As they say, its all a learning curve. My beach pebble is only marginally better, but I got the idea right. 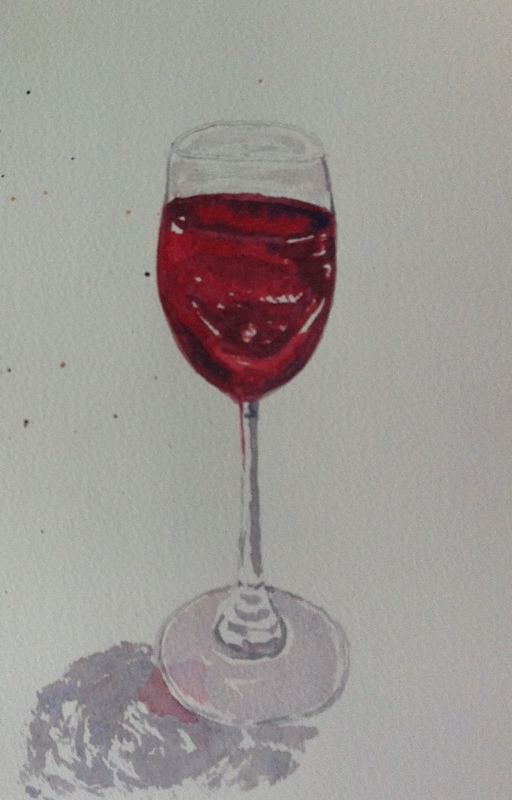 Here is a quick study of a glass of wine. I have no trouble painting or drawing glasses of wine. This was easier to paint in watercolors than I thought it would be. My teacher was particularly happy with this, especially as I captured the reflection of the wine in the shadow and base of the glass. So on that high note, Cheers!